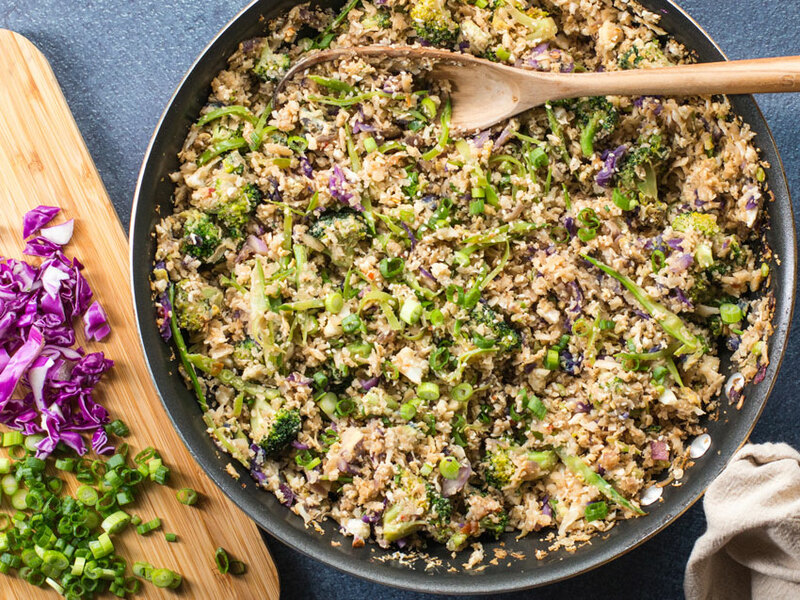 This keto recipe for cauliflower fried rice is veggie loaded and only has 10 net carbs per serving. 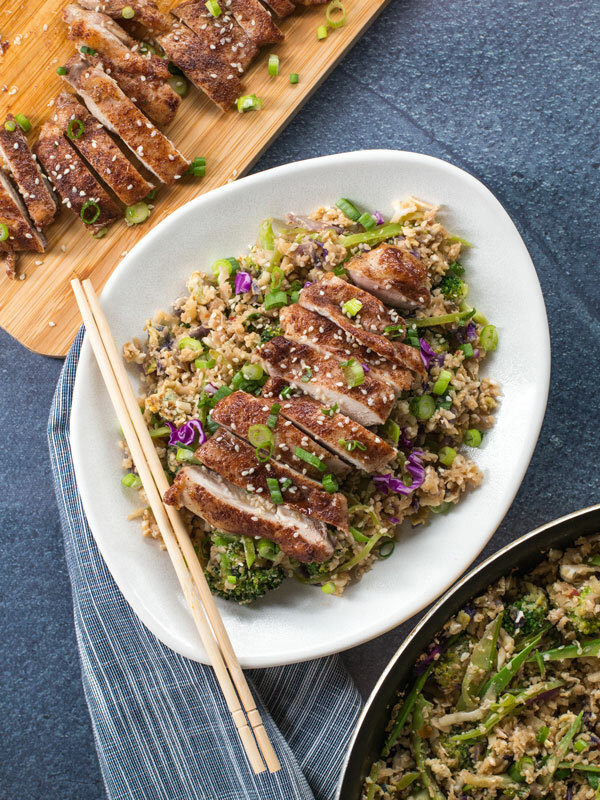 It's paired with Chinese 5 spice crusted chicken thighs to make five servings of keto meal prep for the week. How Do I Make Keto Cauliflower Fried Rice? I would advise not to buy the grated cauliflower rice at the store. 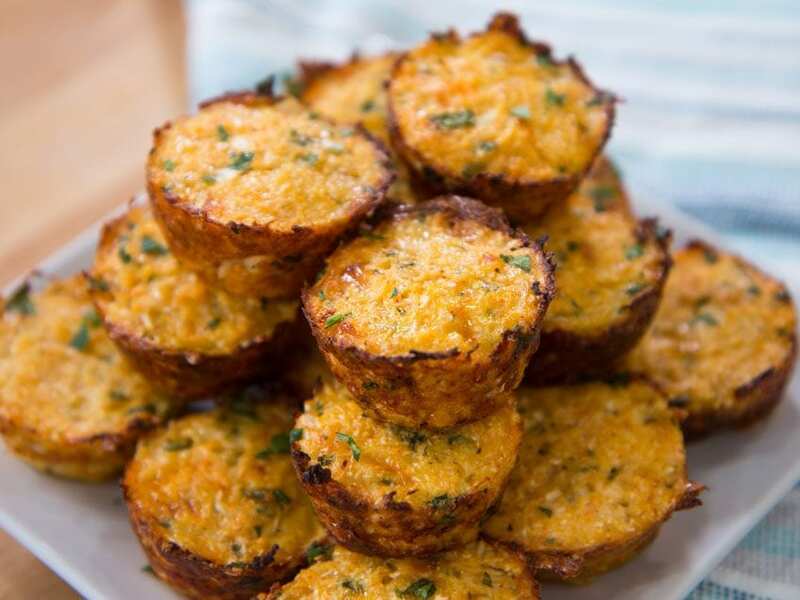 The texture and flavor will be much better if you use the large setting of a box grater and do it yourself. The riced cauliflower at the stores is made up of stalks. Can you believe that? You are paying for cauliflower stalks, not the tender and juicy florets. Not only will it be cheaper to make your own cauliflower rice at home, but the florets will yield a tender, juicy cauliflower rice. One large head of cauliflower will make about 5-7 cups of grated cauliflower rice. Make sure to cut the cauliflower head into 4 parts and the grate it directly into a large bowl, trying not to use too much of the stalks. You can save the cauliflower stalks and use them to make veggie stock or chop thin and add to a stir fry if you want. To cook the cauliflower fried rice, first cook the veggies in this recipe like the broccoli, cabbage, onions, and garlic. Then scramble the eggs and add the riced cauliflower. The key is to cook the cauliflower rice long enough to get rid of the raw crunch, but not too long that it becomes mushy. I find that cooking it over medium-high heat for 5 minutes with the veggies, stirring often, will yield the perfect texture and make the cauliflower almost have that fluffy texture like white rice. To keep this meal prep recipe ketogenic, I am using coconut amino acid instead of low sodium soy sauce. You can find this at Trader Joe’s for a really good price. My fantastic 3 sauces that I use to make the flavors of this keto cauliflower fried rice pop are: toasted sesame oil, sambal olek or sriracha sauce, and amino acid. You can adjust the amount you use based upon personal preference. To add some extra healthy fat to this recipe and make it keto, I decided to use boneless chicken thighs and dust them in Chinese 5 spice. This spice is incredible because it’s made up of 5 different spices, so the rub is already made for you. Allow the spice rub to sit and marinate on 10 chicken thighs for 20-20 minutes. This will take the chill off the chicken and allow the marinade to inject some flavor. 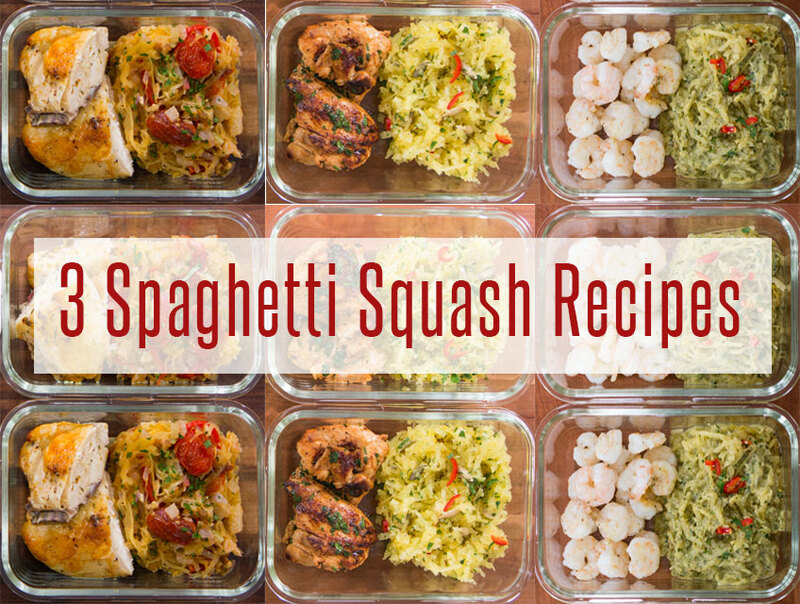 The meal prep recipe makes enough for 5 servings for the week. 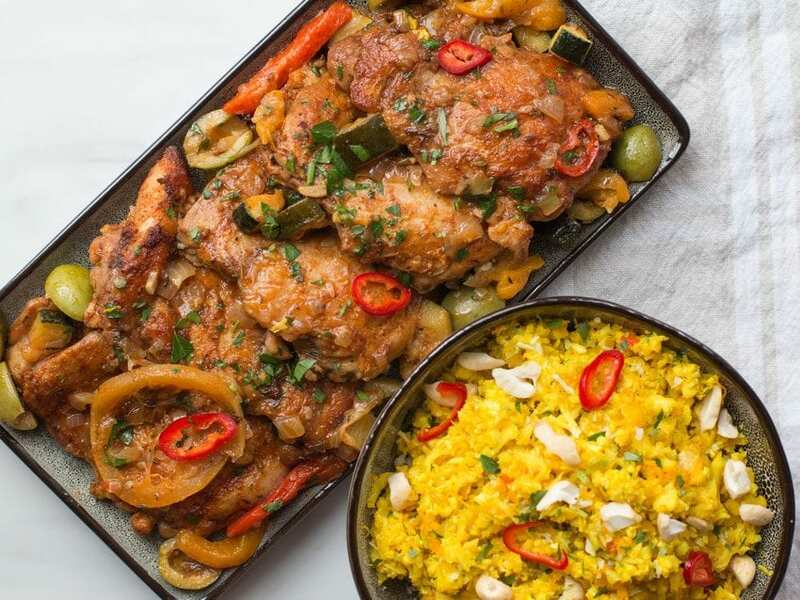 Each meal has two 4-ounce chicken thighs plus a healthy portion of low carb cauliflower rice. You can freeze the chicken, but I don’t recommended freezing the cauliflower rice. I will explain why below. The best way to re-heat this keto meal prep the following days is in a 350 degree F oven for 7-10 minutes. If using a microwave, cover the container with a wet paper towel and make sure not to overheat or the chicken will dry out. You should not be buying frozen cauliflower rice because the texture will be mushy and not nearly as good as if you grate fresh cauliflower florets. Once you freeze cauliflower, ice crystals form, and when defrosted, the texture is soft and mushy. Plus, the frozen and pre-made cauliflower rice at the stores is made up almost entirely of stalks. Who wants to pay money for cauliflower stalks!? Are Keto Recipes Gluten Free? 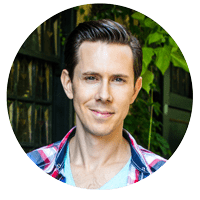 Yes, all keto recipes are gluten free because wheat, grains, and starches are very high in carbs, making them a no-no for the low carb keto diet. You will often find dairy in keto recipes, but I try to always give you the option to go diary free because that makes the recipe Whole30 compliant also. A good example of that is my keto shrimp burger meal prep and Dessi’s epic keto fat bread. 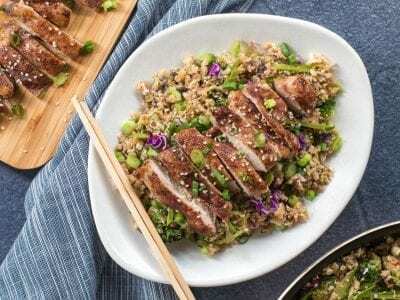 This keto diet recipe has low carb cauliflower fried rice with Chinese 5 spice crusted chicken thighs. Recipe makes 5 servings of meal prep for the week. I show how to make cauliflower rice at home instead of buying the pre-made ones from the store, and this low carb fried rice is the bomb. 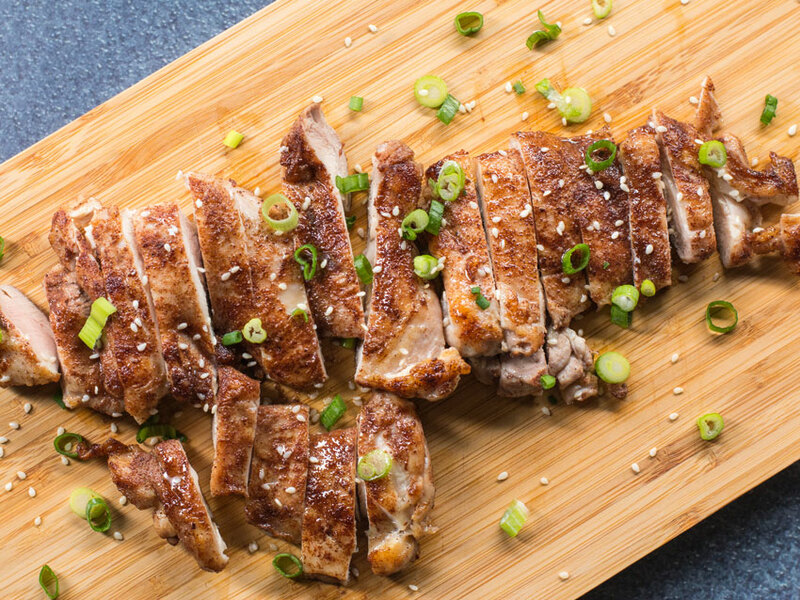 Season the chicken thighs with a generous pinch of salt and Chinese 5 spice on both sides along with 1 teaspoon of oil and rub the spices into the chicken. Allow to sit at room temperature for 20-30 minutes. Meanwhile, to make the cauliflower fried rice, use the large setting on a box grater to grate the cauliflower until you have 5 cups, set aside. Pre-heat a large non-stick pan or wok over medium-high heat for 1 minute along with 2 teaspoons of oil. Add the onions, broccoli, ¼ teaspoon of salt, and a couple cracks of pepper. Cook for 6 minutes, stirring a few times. Add the snow peas, cabbage, garlic, ginger, and cook another 2-3 minutes, or until the broccoli has softened a bit. Whisk the eggs in a bowl, make a well in the middle of the pan with the veggies, and add the eggs. Mix the eggs until they look like a soft scramble and immediately add all the cauliflower rice and mix very well. Add the amino acid, sambal or sriracha, toasted sesame oil, and mix well. Cook for 5 minutes, stirring very often. Check for seasoning, you may need more of the sauces. 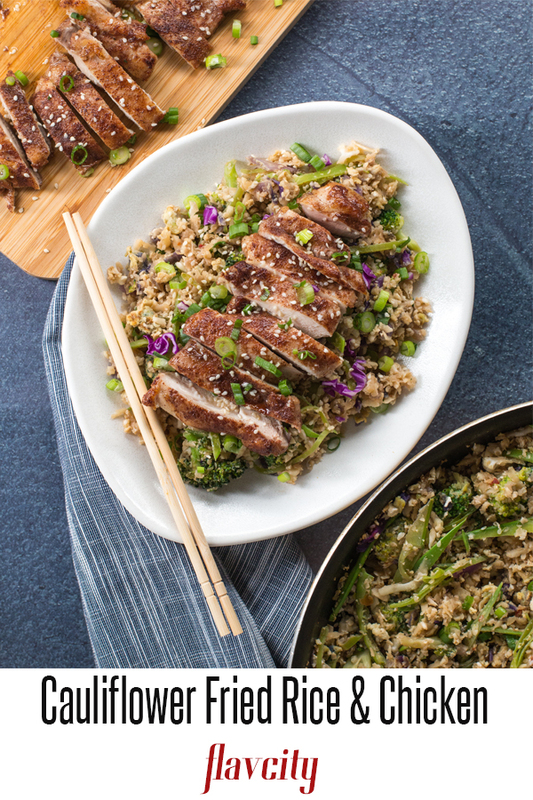 Turn the heat off the pan and add the green onions and sesame seeds, mix well and transfer the cauliflower rice to a large bowl. Use the same pan to cook the chicken by pre-heating it over medium-high heat for 2 minutes with 2 teaspoons of oil. Add half the chicken and cook for 4 minutes, flip and allow to cook another 3-4 minutes, or until the chicken is cooked through. Once the chicken hits the pan, only flip it once, the goal is to create a beautiful crust and not disturb the chicken by moving it. Remove chicken from pan and cook the second batch. If you overcrowd the pan, the chicken won’t sear and get a nice crust. Serve the chicken with the cauliflower fried rice and enjoy! Everything will last in the fridge for 5 days, only the chicken can be frozen for 2-3 months. To reheat, the preferred method is in a 350 F oven for 7-10 minutes, or if using a microwave, cover the container with a wet paper towel and make sure not to overheat, or the chicken will dry out. I tried this recipe last night and it did not disappoint. The rice was great (i made mine with broccoli and mushrooms because that is what I had, but left out the red cabbage to reduce carbs). I have eaten my fair share, and probably others fair share as well, of cauliflower rice. The addition of the amino acid, sambal olek, and toasted sesame oil (things i just happen to have in my pantry believe it or not) added an incredible depth of flavor. I also just happen to have Chinese 5 spice which was amazing on the chicken, i hope you can find more recipes to load which include 5 spice. Great recipe! Keep up the good work. wow..you have a stocked pantry..which is one of my most important kichen tips! Great job my friend. Hey Bobby and Dessi ….this recipe was the hot diggity dang for us, biggest hit for us so far. My husband ABHORS cauliflower. So when I served him dinner he asked me what the brown veggie was, I just replied a whole lots of veggies mix together with coconut liquid amino acid. He had seconds and took some for lunch the next day. After two days I had to confess I had used cauliflower and he is now a believer. Trying to start Keto but I want to make sure my husband is on board. I’ve become an expert at shopping for different spices. But I’m very fortunate to be in the NYC area, so I have a lot of spices store. Thank you, thank you, thank you for your passion and educating us. And yes, I forward all your videos to my family and friends cause I take pics of how mine comes out….lol. I was never a cooker, but your recipes are easy and just impressive! wow..that is awesome Esther!!! I love that you totally fooled him..too funny!! Thats for spreading the love..we really appreciate it! I made this last night and it was the BOMB! Super easy to throw together too (once all the veggies were chopped and prepped). I started Keto a month ago and this will definitely be a recipe i will make again.Tastes like an authentic Chinese fried rice! Not sure if I’m going to do Keto, and I have started looking into it, but don’t think I can live without my wine at dinner. That said, I saw your video on this yesterday and had to try it. Super easy to do, except “rice” does need a lot of prep time. It came out great and I pretty well followed recipe, except added bacon at first and, of course, extra sambal olek. The chicken was fantastic. It came out super tender, with a great taste. Kudos from the Western Suburbs. Richard, so happy to hear it! Glad you put your own twist on it!